Barack Obama at a campaign rally for Gov. Dannel P. Malloy four years ago. Barack Obama delivered an endorsement of Ned Lamont’s candidacy for governor Monday, citing a moment of courage that Obama found less inspiring a dozen years ago. Back then, Obama came to Sen. Joseph I. Lieberman’s defense, urging Connecticut Democrats not to abandon Lieberman for Lamont over the war in Iraq. Lieberman was a staunch supporter of the war; Lamont was not. “When Ned Lamont stood up to his own party and opposed the war in Iraq more than a decade ago, he showed the courage to do what was right,” Obama said in an endorsement statement released Monday by Lamont’s campaign. That was not the message in March of 2006, when Obama was a new U.S. senator, a rising star in Democratic politics, and the keynote speaker at an annual fundraising dinner in Hartford. As Obama spoke, Lamont was seated with his wife, Annie, at Table 96, just outside the kitchen and far, far away from the roped-off section of party insiders, elected officials and big donors in the front of the room at the 58th Annual Jefferson Jackson Bailey Dinner, as the fundraiser was known then. The party has since revised its views of Thomas Jefferson over slavery, Andrew Jackson over his treatment of Indians, and Joe Lieberman over, well, a lot of things. Despite his cheap seat at that long-ago dinner, Lamont went on to win the Democratic primary for U.S. Senate, but Lieberman ran and won as a petitioning candidate in November. Lieberman remained a member of the U.S. Senate’s Democratic caucus, but he never was invited back to the Jefferson Jackson Bailey soiree. He did not seek re-election in 2012. Lieberman endorsed his friend, Republican John McCain, over Obama in 2008 and was a featured speaking at the Republican National Convention. McCain later acknowledged that Lieberman, who was the Democratic nominee for vice president in 2000, was his first choice of a running mate, not Sarah Palin. 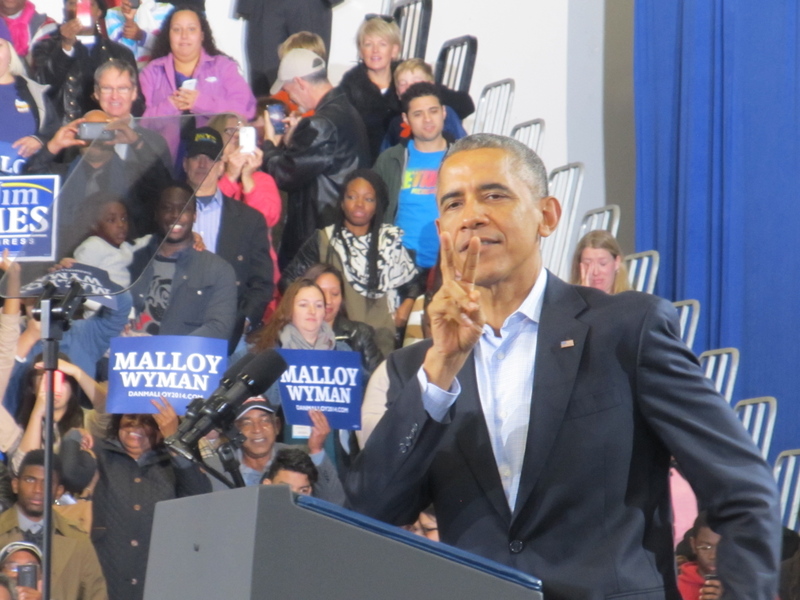 Obama praised Lamont on Monday as a successful businessman who demonstrated an ability to bring people together, and who created good-paying jobs while volunteering as a teacher in a Bridgeport high school.